Hello, my name is Mary Morgan. I was born in Chicago and grew up in Kansas City. My summers were spent in Tulsa with my Grandmother where I first took art classes at the Philbrook Art Gallery and later was an assistant art teacher. There I could do what I loved, draw! My grandmother always encouraged my art with trips to the ballet and art museums. She also let me keep all kinds of animals to draw from: mice, guinea pigs, chicks and even a small bat. My father’s nightly readings of Charlotte’s Web, Stuart Little and the Wind in the Willows also inspired me. I was so charmed by these stories I knew I wanted to create books too. 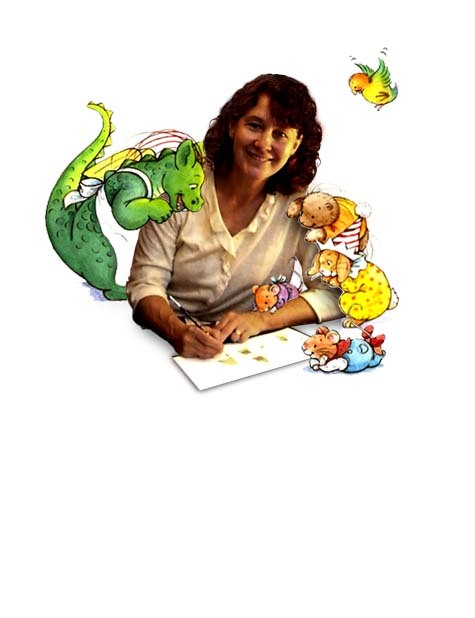 After studying art at the Kansas City Art Institute and the Instituto de San Miguel de Allende in Mexico; I worked as an illustrator at Hallmark cards for ten years. My first book was published in 1987. In the past twenty years I have illustrated over forty books, many of which I also wrote: from Jake Baked a Cake, Sleep Tight Little Mouse to my most recent book, Dragon Pizzeria. My husband and I live part-time in France in a small medieval village, Semur en Auxois and part time on a sailboat. We have spent the last four years sailing in the Mediterranean: around Croatia, Italy and the Greek islands. We are now in Turkey and we love it: people are warm and the country is beautiful and full of history. We are hiking the Lycian Way, a road and trail system that is 2,500 years old, linking Lycian cities that are now in ruins. One feels a mystical connection with all the thousands of people who have traveled these roads built so many centuries ago. It is one of the most stunning and varied paths in the world. And even more exciting… we now have two adorable grandchildren, Olivia Rose and Luca, and another one on the way!